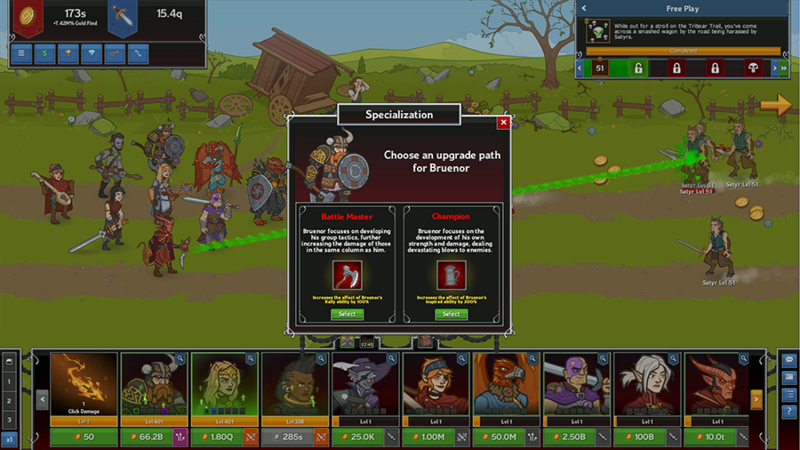 Tags: idle, champions, early, access, event, feast of the moon, gromma, vlahnya. As the Feast of the Moon approaches, the Champions descend into an infamous crypt in order to pay homage to their deeds. Feast of the Moon 2 runs until Monday, November 26th at 12:00pm PST, introduces Vlahnya Um'Vairar, Eladrin Bard and Wizard, and also brings back Gromma Nander, the Tortle Druid! Fate Weaver, Spy mistress, New Olamn college of whispers instructor, Band Manager of Sirens of the Realms & Magic Missile, long time pal of Durnan. This noble looking Eladrin Elf has friends in high and low places. Her true origins are unknown though it is rumored she traveled across Faerȗn with a bard troupe and learned about the world one tavern at a time. Vlahnya is a Support Champion, able to buff Champions in columns ahead of her with Enthralling Performance. The more harmonious the party, the greater the buff. When you want to add Vlahnya to your party, you can swap her with Delina (Slot 8). 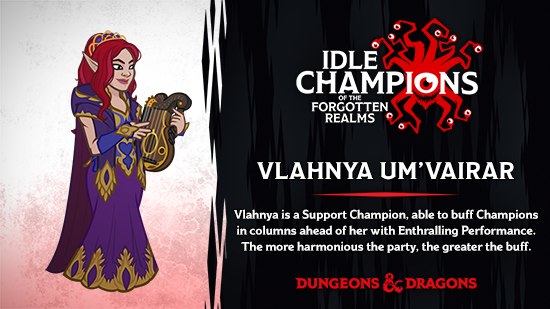 For more information about our latest Champion, check out the Idle Champion Spotlight - Vlahyna dev blog! 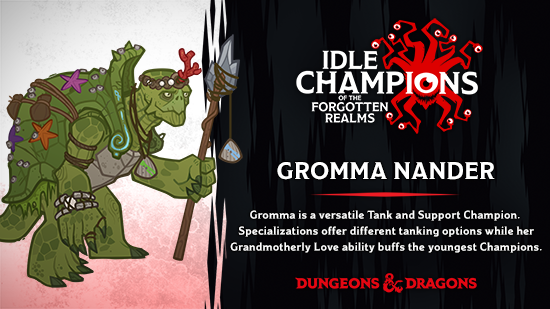 A wise Tortle matriarch, Gromma Nander is an elderly Circle of the Land Druid with nearly one hundred grandchildren. She has picked up many skills over her long life, and is able to fulfill DPS, support, or tanking roles in a formation. No matter her specialization, Gromma has a particular grandmotherly fondness for young members of any race, and will empower members of her party, with the youngest receiving the greatest boost. Gromma is a versatile Tank and Support Champion. Her Druid Circle specializations offer different tanking options depending on the situation, while her Grandmotherly Love formation ability buffs your party, with the youngest Champions receiving the greatest benefit. When you want to add Gromma to your party, you can swap her with Nayeli (Slot 3). Inevitable Betrayal — Skeletal warriors accompany you in your adventures through the crypt of legends. They take up 2 slots in the formation. While they are both 'alive' the champions deal 50% less damage. Siren's Song — A doppelganger has taken on the guise of Vlahnya and is filling the crypt with dissonant tunes, waiting to destroy Vlahnya and take her place. Vlahnya starts the adventure in your party. This Doppel-Vlahnya appears in each area, stunning Champions, and only the true Vlahnya can deal damage to her until she reverts to her Doppelganger form. Undead Legends — Additional undead stalk the Champions within the crypt. 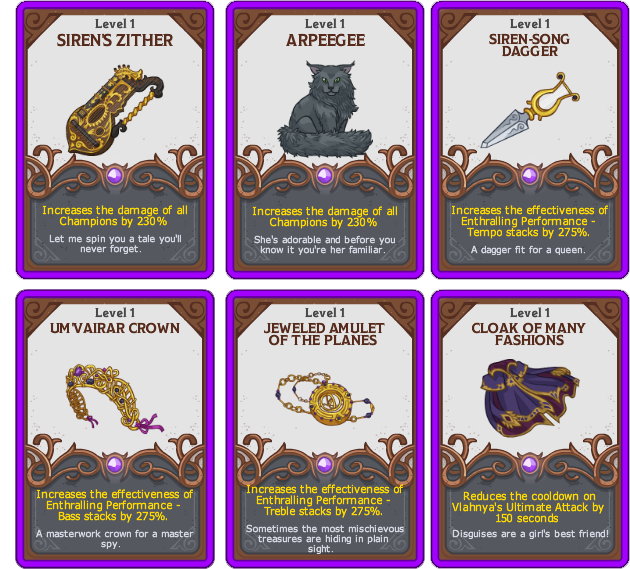 Additional boss monsters appear in each boss area, including some legendary bosses from your past, present, and/or fugure. This variant features unique dialogue. 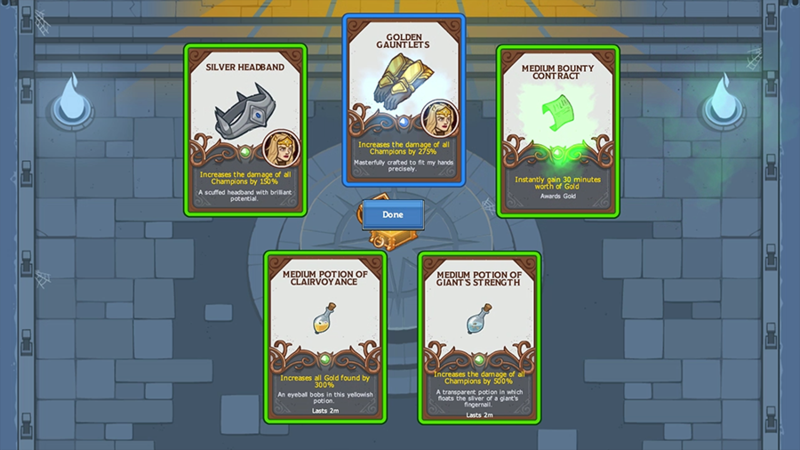 Respectful Restraint — Ultimate Attacks are disabled, and any attacks with a cooldown of 5 seconds or less have an additional 3 second cooldown (so a 4 second cooldown becomes 7 seconds, but a 6 second cooldown stays at 6 seconds). 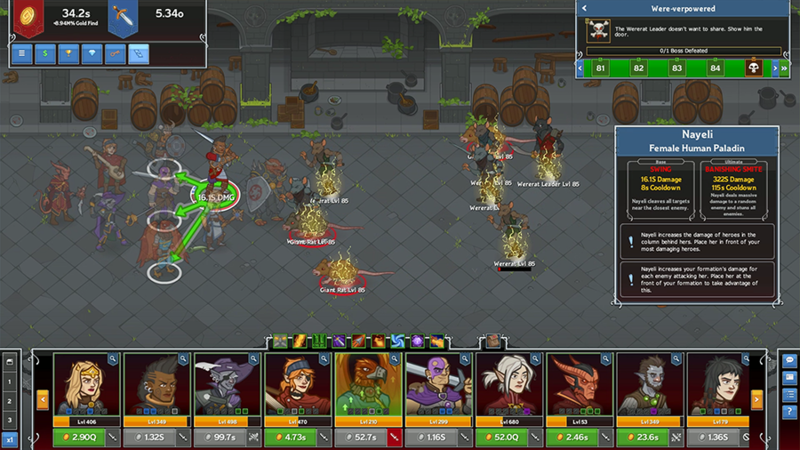 These lengthened attacks don't do any additional damage due to their longer cooldown. 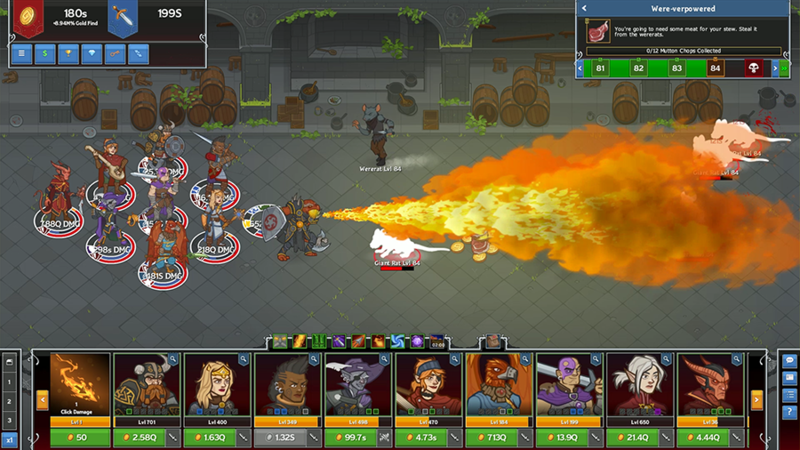 The Relentless Undead — Undead monsters have their health doubled, and when they take a killing blow, they are stunned for 10 seconds before coming back to life (they still drop gold and quest items and count towards the quest each time they are killed). A Grand Nandventure — Gromma Nander is forced to be in your formation. She starts at level 1 in your formation right away alongside Bruenor (or Deekin). Gromma cannot be removed from the formation or moved from her formation seat. 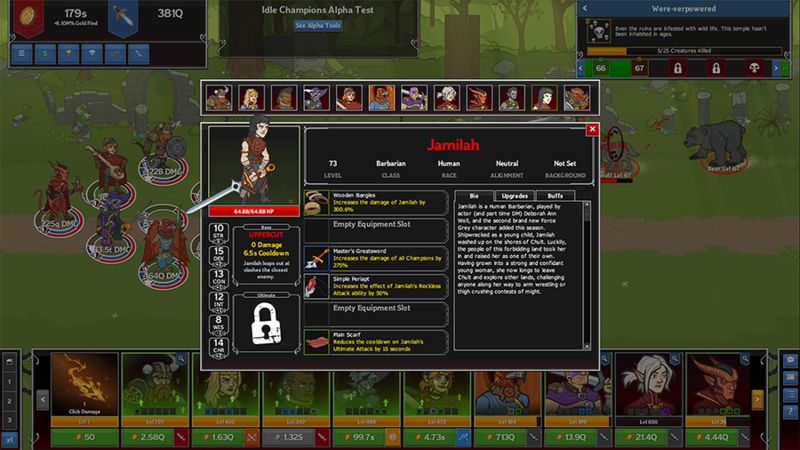 She has a 4x damage boost and her normal attack cooldown is reduced by 2 seconds.